“The Talk” painting by Michael D’Antuono, reproduced with permission by the artist. In honor of Martin Luther King Day, activist artist Michael D’Antuono is releasing “The Talk,” his painting highlighting the inconsistent progress America has made concerning racial justice since Dr. King’s historic Selma to Montgomery marches. 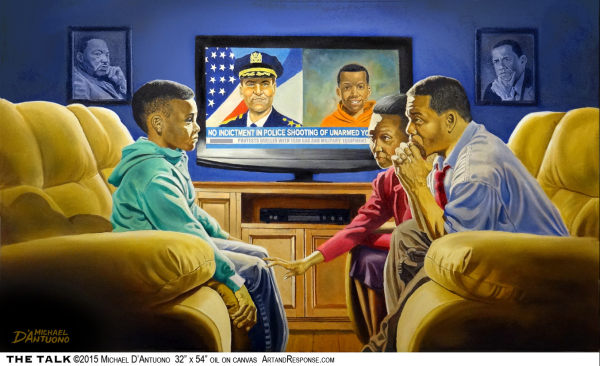 The painting depicts a pair of concerned African American parents sitting across from their son, bathed by the blue light of the television news reporting no indictment of a police officer in the shooting of an unarmed black child. In the background on either side of the television hang portraits of a seemingly distressed Dr. King and President Obama. One can assume that the talk referred to in the painting’s title is one that few white parents have, with the famous exception of New York mayor Bill DiBlazio. “I doubt that Dr. King would have ever dreamed that in 2015, African American parents would still find it necessary to warn their young sons about the dangers of being black in America.” said D’Antuono. In the interest of creating an open discourse, the artist welcomes the public to view the piece on his website and share their thoughts on the current state of racial justice. D’Antuono is exactly right. Progress on race relations in America has been inconsistent. On one hand, African Americans no longer face the overt racism and segregation they dealt with when Dr. King was alive. 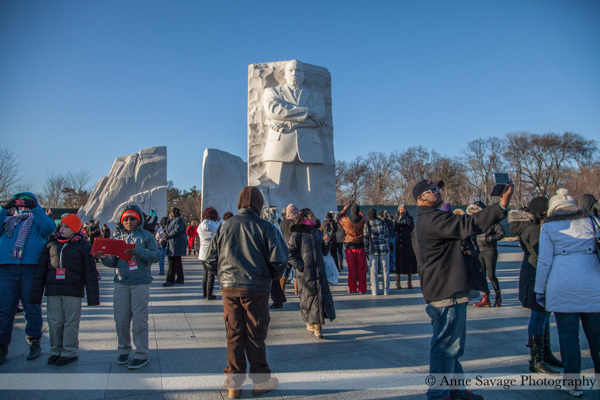 During a visit to the National Memorial in his honor in Washington, D.C. a couple of years ago, Anne and I saw countless young black Americans hamming it up for photos in front of the stone memorial commemorating his life. Few if any of them have dealt with having firehoses trained on them or police dogs attacking them. Rather, they were enjoying a day in our nation’s Capitol, free to eat where they wanted, ride public transportation equally with whites, and unrestricted by racist segregation in its most blatant forms. On the other hand, black Americans still face institutionalized discrimination and an unfair justice system that simply cannot be ignored. D’Antuono’s painting depicts a scene few white parents of white children ever experience. We have no need to instruct our sons and daughters that, because of their skin color, they need to behave differently than their white counterparts. So, today, as we honor the gains made thanks largely to the efforts of Dr. King, we must also honor his legacy by not being satisfied with the status quo. The only proper way to honor Dr. King is to continue to fight racial injustice in all its manifestations. We have come a very long way but we still have far to go. 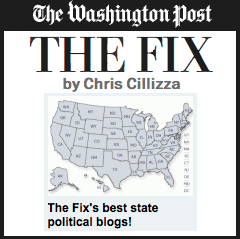 It would be a marvelous thing if speakers all over our nation could talk about this problem in terms of a problem that once existed but that no longer has existence. But see if I stop now I will merely be stating fact and not telling the truth. You see a fact is merely the absence of contradiction but the truth is the presence of coherence. Now it is a fact that we have come a long, long way, but it isn’t the whole truth. And in order to tell the truth, I must give the other side and if I stop at this point, I may leave you the victims of a dangerous optimism if I stop now. I may leave you the victims of an illusion wrapped in superficiality. So, in order to tell the truth, it is necessary to move on and say not only have we come a long, long way, we still have a long, long way to go before the problem of racial injustice is solved in our country. Now I need not dwell on this point. 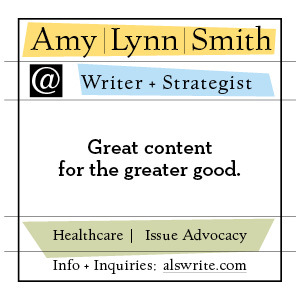 We need only turn on our televisions and open our newspapers and look around our community. We see that the problem is still with us.